So, it’s the new year and I’m back in Wick, pursued by gale force winds wherever I go like some hero of ancient Greece harried by the Furies (though Odysseus probably didn’t have to deal with quite so much sleet). Even a five-minute trip up the road to Tesco’s involves wrapping myself up like an arctic explorer and borrowing the neighbour’s dog and a skateboard for a makeshift sled. Along with my Mahler CDs I brought my New Year’s Eve cold up with me (a gift that keeps on giving, unfortunately; on those rare occasions when I dare peek in my handkerchief it looks like I’ve smashed a bunch of snails in there with a rolling pin). Never mind! 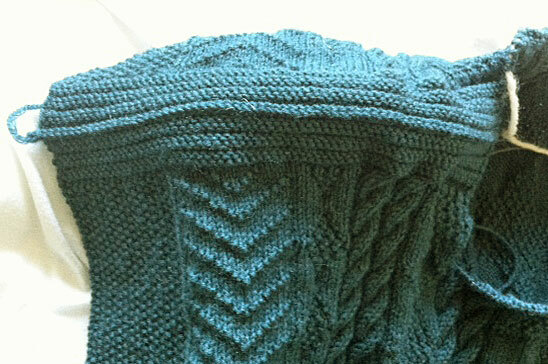 I reached another landmark on the gansey this week, finishing the front yoke and joining the shoulders together. As usual, the shoulders were joined with the standard 3-needle bind-off (it says here), in which each shoulder’s stitches are placed on a double-pointed needle and aligned side by side, and then cast off with a third needle. The advantage of this method combined with a “rig and furrow” shoulder is of course that the cast-off row forms an extra “rig”, or ridge, and makes for a pleasingly seamless effect. Now, with regard to the neckline (pay attention, questions will be asked at the end of the tour). Traditionally, the front and back would have been exactly the same, so the gansey could be worn with either side facing; both sides were identical, in pattern and length. However, if you want a shaped neckline, and let’s face it most of us do, it isn’t usually a problem – except on patterns such as this one, where you have a large panel like the centre star which has to be cut into to make room for the neck. I decided to cut the star cleanly in half, rather than fill the space with another pattern that would fit better but which wouldn’t feel right. That in turn dictated how much of a “curve” the neck would have. The custom for sizing the neck was to divide the row into thirds at the neck (one third for one shoulder, another for the neck, the final third for the other shoulder) – and that’s what I did here, giving me 3 equal portions of 72 stitches. Now, I want to have a nicely curved neck at the front, not a rigid rectangle. So I have to do some some shaping. There were 20 rows remaining from the point where I made the division, cutting the star in half, to the point where I would start the rig ‘n’ fur shoulder straps. If I decreased at a rate of one stitch every other row, either side of the neck, (my usual rate of decrease), then that equates to 10 stitches per side. So I had first to move 10 stitches from the neck allocation to each shoulder: I then had two portions of 82 stitches (the shoulders) flanking one of 52 (the neck). Then it was just a case of working each side back and forth on double-pointed needles either side of the neck, decreasing every other row, so that after 20 rows I was ready to start the shoulder strap with the right number of stitches – 72 – and I had a nicely shaped neck. 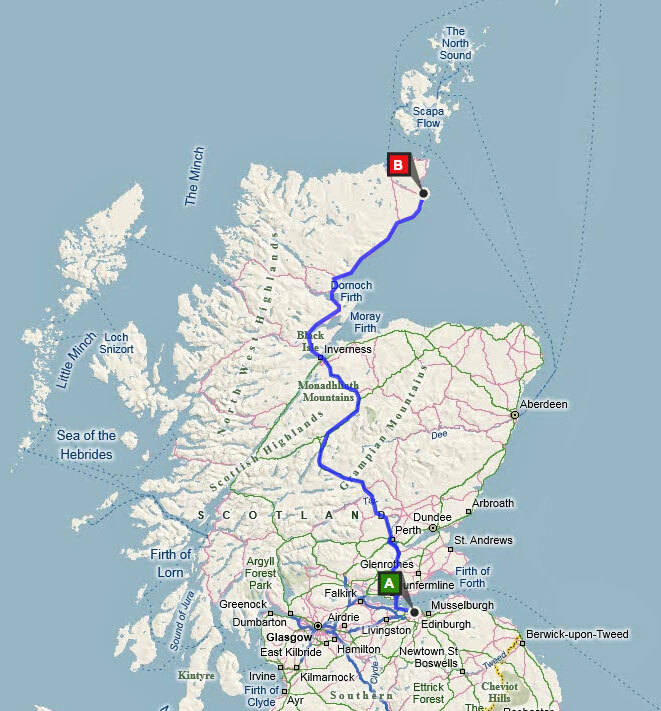 I’m only up in Wick for a few days this time, since on Tuesday I fly back to Edinburgh (I have several meetings to attend in Glasgow and Edinburgh, so I’ll be staying at the flat again and flying back on Tuesday 16th). This seemed like a good idea until I remembered that the planes that fly out of Wick are made out of balsa wood and the propellor is powered by a giant elastic band; and then, of course, there is the wind to think of (hello Edinburgh, goodbye lunch). At least with the wonders of the Internet I can be presentialiter, no matter how remote the remota may sometimes feel! 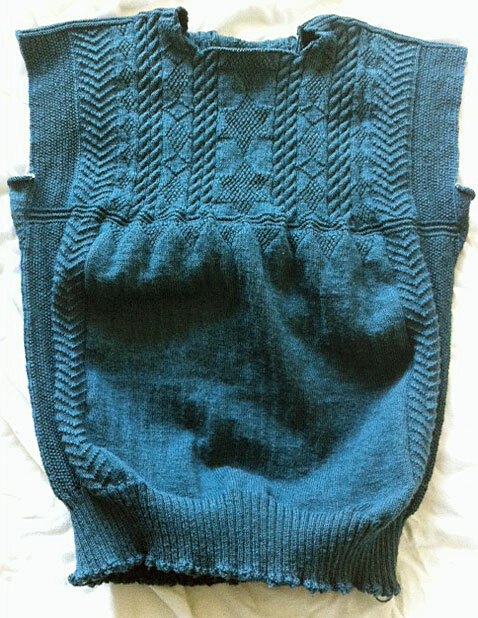 What a great milestone on the gansey, it has developed a real ‘personality’ and I’m anxious to see what pattern you’ve chosen for the sleeves. I certainly hope spring and summer offer you something optimistic, I’m afraid my spirit would plummet with the challenges you have faced with your move to the north. Are you taking your vitamin D3! Yes, reading throught it again I see the dial on my self-pityometer was turned up to 11! (I blame the cold.) In fact, today was a beautiful day, blue skies and bright sunshine, so no complaints this time. The gansey is looking very handsome. 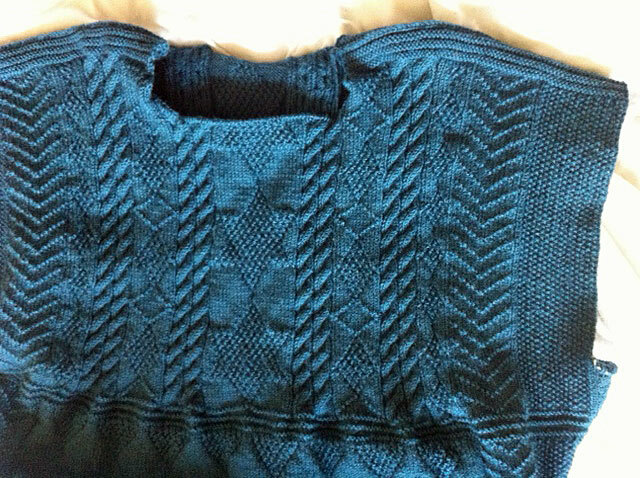 I’d be tempted to crochet an edge on the armholes and wear it as a vest. Enjoy the sunshine! Here we’re discussing whether what we’re seeing is Jove’s dandruff, the Norse Giants’ cigar ashes, or an unusually late fall of pollen. I’m voting for pollen.